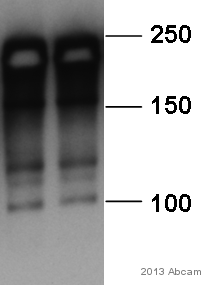 Recombinant full length protein corresponding to PSD95. 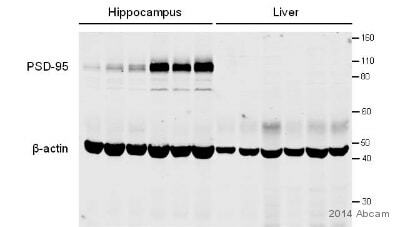 In Western Blot, this antibody gave a positive signal in rat and mouse forebrain and hippocampus tissue lysates. Our Abpromise guarantee covers the use of ab2723 in the following tested applications. WB Use a concentration of 1 - 5 µg/ml. Detects a band of approximately 95 kDa (predicted molecular weight: 80 kDa). 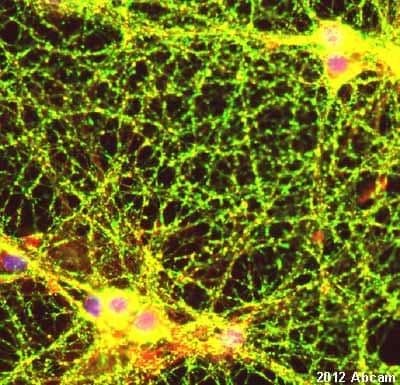 ab2723 staining cultured rat primary hippocampal neurons by ICC/IF. The cultured neurons were fixed with 4% formaldehyde for 5 minutes and blocked with 10% donkey serum in 0.1% PBS- 0.3% TritonX for 30 minutes at 24°C. The cultured neurons were then stained with ab2723 at 1/1000 in 0.3% TritonX with 0.1x PBS and 10% donkey serum for 4h at 24°C. 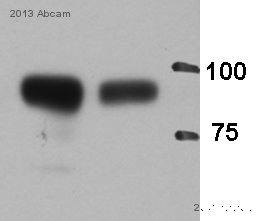 An Alexa Fluro 568 donkey anti-mouse polyclonal antibody at 1/1000 was used as the secondary antibody. PSD95 (which stains the axons and dendrytic spines) can be observed in red (Alexa fluro 568 secondary). Synaptophysin is observable in green (alexa 488 secondary) and colocalizes with PSD95 in dendritic spines. 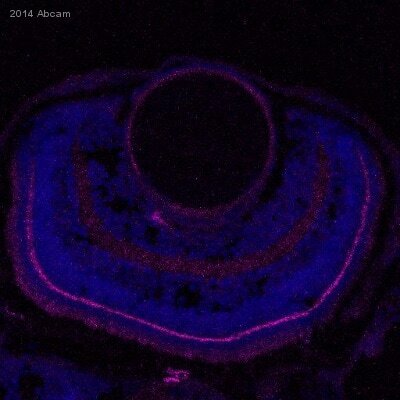 Nuclei are stained in blue with 1.43µM Hoechst. Additional bands at: 100 kDa, 110 kDa, 80 kDa. We are unsure as to the identity of these extra bands. ab2723 staining PSD95 in Zebrafish retina (outer plexiform layer) tissue sections by Immunohistochemistry (IHC-Fr - frozen sections). Tissue was fixed with paraformaldehyde, permeabilized with Triton X-100 and blocked with 5% BSA for 1 hour at 23°C. Sodium citrate antigen retrieval was used. Samples were incubated with primary antibody (1/100) for 16 hours at 4°C. An Alexa Fluor® 647-conjugated goat anti-mouse IgG polyclonal (1/1000) was used as the secondary antibody. ab2723 at 1/200 staining rat primary hippocampal neurons by ICC/IF. The cells were paraformaldehyde fixed and then permeabilized with 0.1% Triton X-100 before being stained with the antibody for 1 hour. 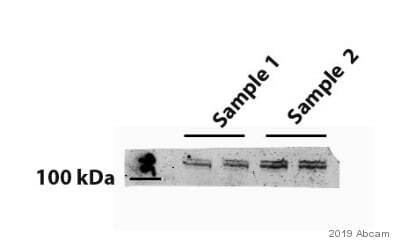 An Alexa-Fluor ® 594 conjugated goat polyclonal antibody was used as the secondary. The antibody shows numerous puncta along the shafts. IHC-FoFr staining of PSD95 on rat hippocampus section using ab2723 (1:3000). The sections used came from animals perfused fixed with Paraformaldehyde 4% with 15% of a solution of saturated picric acid, in phosphate buffer 0.1M. Following postfixation in the same fixative overnight, the brains were cryoprotected in sucrose 30% overnight. Brains were then cut using a cryostat and the immunostainings were performed using the ‘free floating’ technique. Publishing research using ab2723? Please let us know so that we can cite the reference in this datasheet. Will PSD95 expression be altered if toxicity is increased in the cells? We do not know how PSD95 expression would be affected if toxicity is increased in cells. We encourage customers to consult the latest literature available through PubMed and other resources in order to find the most up-to-date information about their specific research interests.